Still thinking of going out and getting that brand new Microsoft Surface RT? Before you do, take a look at gizmodo’s gallery of every Microsoft hardware product ever. 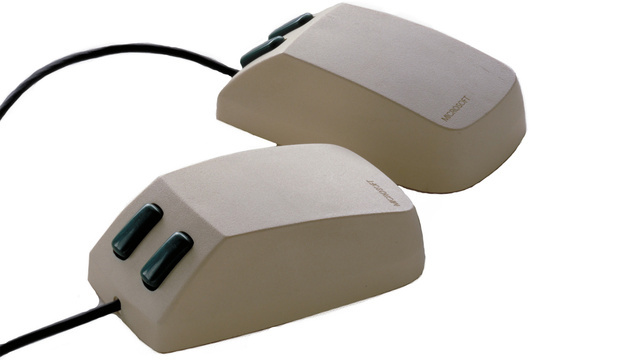 Some of them, like the mouse shown above, look goofy because they’re so old, but there’s one thing you’ll notice… Microsoft spends a lot more time updating the color and shape of their products than they do actually improving them. Maybe that’s why the touch cover for the Surface comes in so many colors. Scroll through and you’ll see a bewildering array of things you wouldn’t be caught dead buying, even if it was 1995 and you wanted to run Tomb Raider. It’s expected that a company that’s been making hardware for 30 years would have some with a genuinely dated look. What’s not expected is that there would be so many products that would do the exact same thing but come in a slightly different size or shape. Then there are products like their teleconference and phone lines that were just plain bad ideas. More than anything, take a look at their Zune products. Here’s what happened the last time Microsoft tried to jump into the portable electronics market. It was a good product, it evolved quickly, but it was buried by its own karma. Microsoft really annoyed a lot of its partners like Toshiba and Creative when they scrapped that program after under 2 years to roll out Zune, its attempt to kill the iPod. It was a good product, filled with good intentions but it entered a market where people already made up their minds. In the end, just as Zune killed Windows Media Players, smartphones (especially iPhones) killed Zune. It’s the circle of life. Now, Microsoft is trying to go head-to-head with its hardware partners in selling a tablet. Several of them have been very vocal in their displeasure… and since this isn’t the first time Microsoft’s played this game, many of them know how it could end. Maybe that’s why HP is investing in Linux. Still, it’s amazingly like the Zune launch. The market has two solid operating systems – iOS and Android – that are doing well in the marketplace. Is there really room for a third? Doesn’t it seem more and more like Microsoft is the third man in a two-legged race? Should you worry about your router being hacked? Slow internet? Blame the neighbors.